Need some last minute decorations for your Halloween bash while saving a bundle? Just up ahead, check out clever ideas for making your own Halloween decorations from scratch created with materials you can easily find around the house. Everyone will think you've spent a small fortune decorating for fright night, while you bask in all the "oooo"s and "ahhh"s from friends, neighbors and party guests. In fact, these decorating ideas are so clever, inexpensive and easy to do... it's scary. This idea is especially good if you have old cardboard moving boxes stored around the house that are collecting dust. Break them down and fashion them to fit your window and you're well on your way to creating a spooky window silhouette for Halloween. First, measure your window. Then, using a straight razor, carefully cut large pieces of cardboard to fit. Next, cut out simple jack-o-lanterns shapes from your cardboard (as you would a pumpkin, but this is much easier and less messy.) Place the cardboard in your window and secured it around the sides with masking tape. And -- voila -- your oversized house decoration is complete. Use the biggest window in your house to really make it shine, and remember to leave the lights on! Yep, this is the glow-stick-in-the-balloon trick, and it's cheap an easy to do for Halloween. All you'll need is a permanent marker, glow sticks, and a bunch of balloons you can easily purchase at the dollar store or your favorite party supply shop. To create and assemble, blow the balloons up half way with air before inserting the glow stick. Then blow up the balloons completely and tie them off. 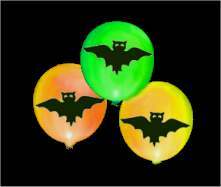 Be sure to place your decorations near a dark and drafty area and have fun watching the eeriefloating effect that your Halloween balloons create. At your next Halloween get together, re-purpose old mason jars to make bright, colorful luminaries to light the way to your house. Use them to line a walkway or to decorate the front porch. You'll need craft paint and a small paint brush to completely cover the mason jars in your favorite Halloween colors. Then, use a permanent marker to decorate with goblins and ghosts. Use a votive candle to light them up. For the complete list of instructions for this project, see homemade Halloween crafts. Halloween Decorations - Flags, banners, wreaths and more, plus a guide on how to decorate your home or apartment. wit tips on creating a scarecrow, haunting your fireplace, and related how to's for decorating for your next Halloween party. Monster List of Halloween Projects - A great resource with hundreds of ideas including links to tips and instructions for building "dummy" zombies and skeleton props, how to make your own fog machine and lots more.